All Photographs and Information © 2004 - 2019, Rocky Mountain Klee Kai. All rights reserved. by Dr. Alicia M. Adams & James E.
We are Alaskan Klee Kai Authors and Breeders. 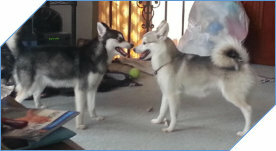 IN THE BEGINNING: The Alaskan Klee Kai breed was first developed in Alaska in the 1970‘s. It is a northern breed that was developed to create a companion sized dog resembling the Siberian Husky and the Alaskan Husky. 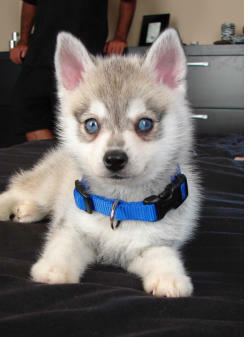 The resulting Alaskan Klee Kai Puppies are intelligent, energetic, apartment-sized dog with an appearance that compliments its northern heritage. We are Alaskan Klee Kai Breeders and Authors. We began our journey with the Alaskan Klee Kai in the Rocky Mountains of Utah in 2004; however, we have owned, bred, and shown northern breed dogs for more than 20 years and we are experienced breeders of these amazing rare breed Miniature Huskies. We have placed puppies throughout the United States including Alaska and Hawaii. We have also placed Klee Kai puppies in Canada, Mexico, South America and Europe. We have all colors and all three sizes of Alaskan Klee Kai Puppies, and occasionally we have older dogs available for adoption too. When we first were introduced to the Alaskan Klee Kai, in our opinion, the dogs had smaller, lighter bone density and there were many rough and long-coated dogs being made available. There was far less of a “standard look” to the breed. The overall appearance of some dogs looked weaker than today (again, in our opinion). IMPROVING THE BREED: Over the past decade, we have witnessed a refinement of the coat and look of the breed (less wooly looking dogs) and a dog that looks and feels more solid and sturdy. This improvement (we believe) is a direct result of time and dedication by responsible, conscientious breeders with a focus on raising the bar of the genetic standard - both the genotype (the actual genetics) and the phenotype (the physical look). As a family, we have more than a decade of experience and dedication with this delightful mini husky breed - sometimes simply referred to as Klee Kai. At Rocky Mountain Klee Kai, our goal is to produce Alaskan Klee Kai Puppies of the highest quality and to match each person to the puppy they desire whether they are simply looking for a pet or searching for a dog to take into the show ring. The AKK comes in three sizes: toy, miniature, and standard. To read more about breed standards, see out FAQ page. Today our dogs are loved and valued family members and are also used for show/breeding, trail hiking, agility, weight- pulling, flyball, obedience competition, therapy and most important - LAP SITTING (please read our Owner's Stories). We receive inquiries from all over the world and have placed puppies throughout the United States (including Alaska and Hawaii) and Canada. PUPPIES: You can fill out a Questionnaire if you would like to find out more information about adopting one of our babies. When you fill out your Questionnaire you will also receive a FREE copy of the text-only version of our book as well as our newsletters. Klee Kai Puppies Have Arrived! CLICK HERE Our website is here for your viewing pleasure. Please read through our website and learn more about the Klee Kai. Also, please visit us on our Facebook Page . We also welcome your emails and comments. EMAIL US Thank you for our visiting our Alaskan Klee Kai website! Our book is entitled: "The Alaskan Klee Kai". It is available in paperback and also as an eBook and for the computer. 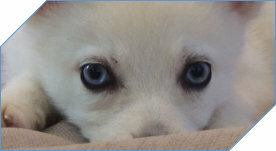 We appreciate your interest in our Alaskan Klee Kai puppy adoption process. We do have litters throughout the year. Those on our Waiting List receive FIRST NOTICE announcements of all new litters. We work off of a Waiting List; however, those with very few preferences (coat color, eye color, size, gender, etc.) usually get to choose a puppy much more quickly. Quite frankly, asking for very specific preferences or traits in your Klee Kai puppy can mean a longer wait time. Mother Nature is also an important factor and influences successful breedings and the outcomes (available litters, colors, sizes, eye color, etc.). The Waiting List consists of a small number of people who have made a decision that they want a puppy. We receive over 400 new email contacts/month. In order to work with those who are serious about moving forward, we developed our Waiting List and it is these folks who receive FIRST NOTICE of new puppies with pictures and quick responses to their questions. We receive a lot of email and questions. We ask you to please be patient. Do you just have a question you would like to ask us? Sending in a contact form is the best way to get an answer. The contact form enables us to get back to everyone who simply has a question. If you are looking to adopt an Alaskan Klee Kai in the near future, you should consider filling out a Questionnaire instead. Thank you for your interest in this wonderful breed. The Questionnaire is designed as the first step in the process toward getting a puppy. This is how it works: 1. Submit a Questionnaire (below). We will respond by EMAIL. 2. Send in your Waiting List Application Form (emailed to you upon request) and the Application Fee (credit toward a puppy) and get on the Waiting List. 3. You Get Added to the Waiting List: we will honor your placement on the Waiting List. You will be directed to our Questionnaire Server.